Home Again: Could You Do Me a Favor? 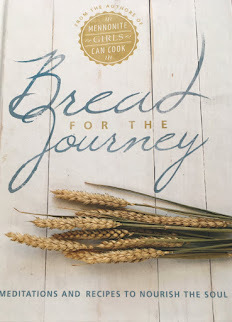 How many times do you want to bake a recipe and you are missing the one single ingredient? Sometime you can substitute, but not this time. It was the first weekend of Advent and it's tradition in our home that I bake Pfeffernusse. Well don't you believe it, I was missing the Lebkuchen Spice mixture for this recipe...I called from the kitchen, "Can you do me a favor?" "Do you have a minute to run to the deli and get me Lebkuchen Gewurz? " Away he goes, finds the exact packets and approaches the clerk, as smug as a button and tells him how his wife sent him for these spices, and the conversation goes something like, "I guess she doesn't trust me, that's why she sent the spice package." The clerk slowly responded saying, "Sir, ...sorry to inform you, but that is not the same package that your wife sent with you, I will find the right package for you." "Oh," he says, "I guess there's a reason why she sent the package along." Sheepishly, he walked out, drove home and told me the story....We had a good laugh. So, I continued to mix up my favorite recipe and invited Levi to come over and help roll out the snakes. It's hard to keep that cookie tin full. He of course wanted to take enough to school to share with all his class mates. So the story continues, as I was baking with my sister this week, we whipped up another batch of Pfeffernusse. Take note, once the dough has been mixed it needs to be refrigerated over night. So just before I was going home from her house,I snuck into the fridge and decided to take half of the dough home for myself....Well, guess what....I had dough...but not till I was home a few days later, did I notice that I had took wrong dough, I swapped her gingersnap dough instead and when she wanted to quickly make up her gingersnaps for the kids, she could not find her dough..., meanwhile I was looking for the Pfeffernusse dough. 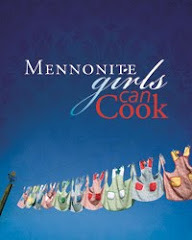 "Too many cooks in the kitchen and too many fingers in the dough"
jump over to Mennonite Girls Can Cook. You'll find it on today's post. And, could you do me a favor? Don't switch recipes on me next year!! Sounds to me the moral of the story should be : Don't steal from your sister! LOL Sounds like a fun day. Is there a homemade mix that would duplicate that special spice you get at the delicatesen? I'm sure nothing like that exists us here in northern Maine. Great pic of your husband looking all smug and pleased. So are you making another batch or two? My pfeffernüsse need to happen yet...this week. I've never used the magic ingredient...I'll have to see what exactly you are adding. So did you mix up a new batch of cookie dough at home...and drive out to the country to replenish your sister's supply? Too funny...about John shopping at the deli! what a comedy of errors.....I love stories like that....too funny. How many cookie stories is this now? It's a good thing I can see you laugh through it all. Love your story, Marg! I giggled at the 'switching of the dough'. I wonder who was more grrrring, you or your sister ?? Before you laughed, that is !! smile..
We both have our nativity scene as our Dec. header.. I love yours! I just recently tore off the label on one of my favorite Christmas teas... but then thought... okay he can remember "Christmas Eve." Laughing Out Loud over here! 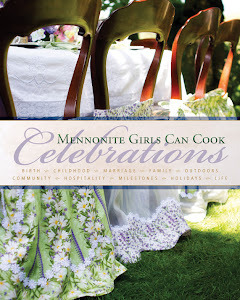 I love the story Marg. . and now I am really hungry for a little chopped snake cookie. . I have no spice ..and no package to take to the deli. . oh dear. I have never eaten pfeffernusse before, but it looks like a fun tradition. I went to the store today to get ready for a party and had to make a second trip to pick up my notebook (shopping list, recipes, etc.). I wish someone had told me to check things before I left! how much or how many gramms is that Lebkuchen Gewuerz? I would really like to know how much you used. so I can try them as well..
Monika, the pgk has 10 grams. The pgk holds close to 2 TBSP. Hope that helps. And you need 11/2 pkg.